Triple version of the Nuovo Gran Sport crankset from the early to mid 1980's. 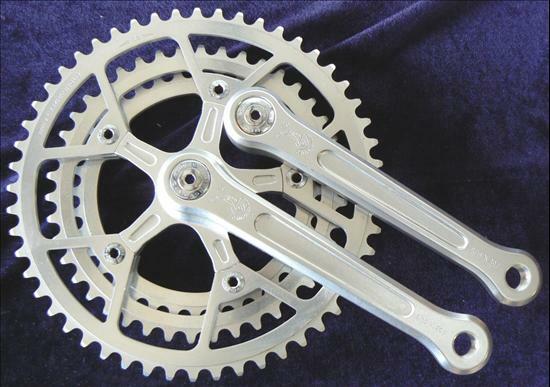 Campagnolo 0305, (Nuovo) Gran Sport (Double, 116 BCD) is the double version of this crankset. Details: The reintroduction of the "Gran Sport" name in the mid 70's found the group situated below the "Record" groups in the Campagnolo line up. This group was eventually phased out in the early to mid 80's with the introduction of the Victory and Triomphe groups. According to the comments in the '85 Campa catalogue e.g. the G.S. crankset (#0304), the pedals (#3700) and the BB (#3331) - or at least the G.S. axle (#3332) - were "no more available and replaced by the Victory range..."